Flies aren’t just annoying airborne pests; they can transmit all kinds of diseases and contaminate food. Growing up, you may have heard that house flies release excrement (poop) every time they land. It turns out this is a myth. At least, not EVERY time. If they’re not pooping when they land, then they are probably puking instead. None of these possibilities lend themselves to anything most people want to have flying – or landing – around their homes or on your body. But, as if that’s not enough to gross you out, many of the chemicals in fly sprays can cause skin blisters, breathing problems and other skin irritations. So what’s a person to do when they have a maggot infested, fly breeding situation in their midst? Good news! There are many techniques to get rid of flies using natural ingredients without the hassle of a fly swatter. 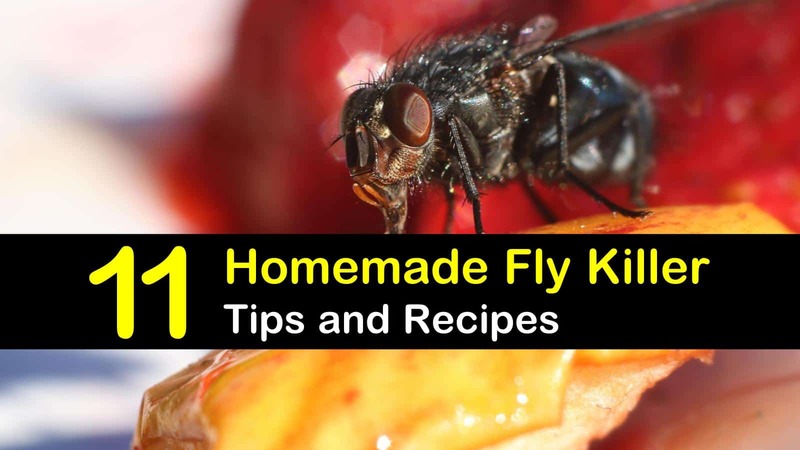 We have created a list of tips and homemade fly killer recipes for getting rid of flies indoors. Many of these methods and tips work on other types of pest control, too – houseflies, fruit flies, and gnats. The way these DIY fly killers succeed is by luring flies in with their sweet scent and then drowning the suckers! The smell of the cider vinegar attracts the flies, but a drop of dish soap in the mixture breaks up the surface tension of the vinegar and water mixture. Otherwise, the flies will land on the surface and sit atop it, completely negating the point of the homemade fly killer. Combine ingredients in a bowl and pour into a spray bottle. Apply in areas where flies are likely to land – your picnic table, patio, etc. While some scents attract flies, others repel them. Many essential oil fragrances can be used as a simple solution to keep flies at bay. Place a small bowl of water with added essential oils or even a candle votive strategically around your house in places where flies like to explore. Your room will smell fragrant, and the flies will stay away. Not even flies can resist the sweet smell of wine. Make a natural fly killer by trapping them. Pour wine in a bowl and cover it with plastic wrap. Tape the plastic wrap around the lip of the container. Poke small holes in the plastic. Leave the pan on the counter or another fly-infested area overnight. Throwing it back to the 1880s for this natural fly killer from the Old Farmer’s Almanac. Note that this recipe calls for milk, so don’t leave it out where cats or other animals can get it or leave it out longer than overnight or you’ll have a different problem on your hands. Combine ingredients in a bowl and set out on the counter or in another area to attract flies. Flies hate lemongrass essential oil. Mixing drops of lemongrass oil with hot water creates an effective DIY fly killer spray that will make your home smell amazing while getting rid of pesky insects. Add water and lemongrass oil to spray bottle and shake well. Spritz anywhere flies are bothering you. Similar to the wine fly trap, the compost bowl fly trap uses the compost as fly bait and traps them under plastic wrap. For best results, you can douse the compost mixture with vinegar or other scents that attract flies. Place compost in each bowl and cover with plastic wrap. Secure wrap in place with tape. Poke small holes in the plastic wrap. Place bowls around areas of the house. As a bonus, you’ve got some compost to improve your garden! Flies, especially fruit flies, are attracted to the smell of fruits. You can use that to your advantage and their demise with this fly trap. Mix dish soap and vinegar and pour over fruit in the bowl. Set on a counter to attract and kill flies. We have given you plenty of information on how to rid your home of flies, but you probably also need to keep flies away from porch and patio areas. Unlike the rest of the items on this list, the bug zapper isn’t a natural remedy to a fly problem, but it is an effective one. Bug zappers use ultraviolet lights to attract flies and other pests and then zap them with electricity. Many of our childhoods are punctuated by the sound of a bug being zapped on a warm spring night. Homemade flypaper can also be used indoors, but it’s unsightly and unsanitary. Typically used in garages or on the patio or porch, the flypaper uses sticky materials to trap the fly. Cut a paper or plastic bag into strips. Mix water with sugar and honey. Coat both sides of paper or plastic with the honey and sugar water mixture. Hang strips in fly-infested areas. You’re not going to get your five-cent deposit back on this soda bottle after you use it to make a natural bottle trap. It works by attracting the flies down into the funnel. Cut off the top half of two-liter soda bottle. Add water. Invert the top of the bottle into the bottom half and add the vinegar to mix it with the water. For some reason, the flies can’t figure out how to get back out of the funnel, leaving them stuck in the vinegar and water mixture. The best part of cold weather is no flies, mosquitos, or other pesky insects infesting your home. With our tips and tricks for killing flies, you can enjoy the warm weather without the annoying bugs. 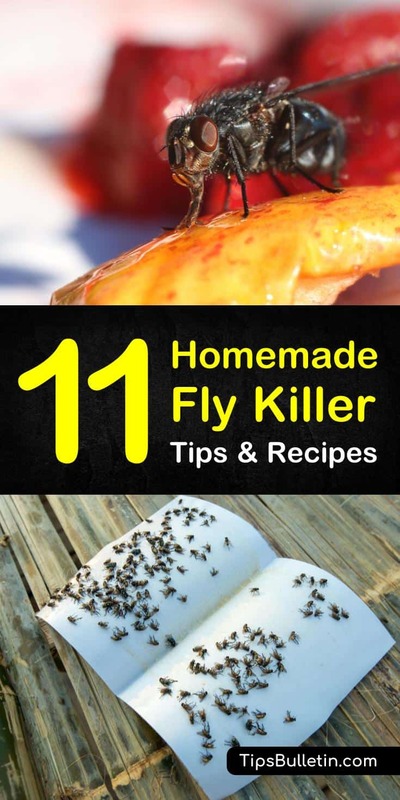 Our natural fly killer recipes and DIY fly killer spray work indoors, outdoors, and even for your chicken coop. Did you try any of our DIY fly killer spray recipes for how to get rid of flies and love how they worked for you? Share with your family and friends on Pinterest and Facebook!